Description: The flower heads are slender, rayless, 5/8 inch (1.6 cm) wide, and surrounded by 5 blue-green, purple-tinged bracts dotted with large, dark purple oil glands. 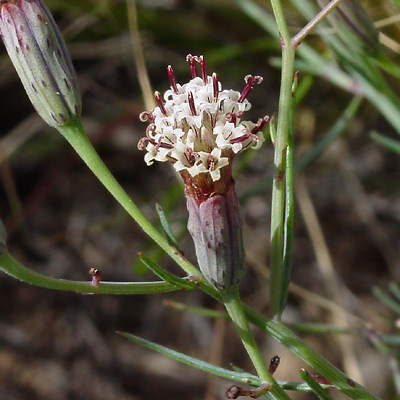 The flowers are followed by bristly seed heads. The leaves are simple, alternate or opposite, glaucous blue-green, narrowly linear in shape, and dotted with oil glands. 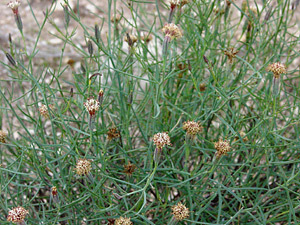 The plants are well-branched with numerous thin, wiry, upright stems. Foul-smelling – The foliage has a strange, unpleasant, rank odor when crushed.